· A little bit of history. As the popularity of online gambling sites started growing back in the 1990s, the government of Antigua and Barbuda was the first country that passed the Free Trade and Processing Zone Act in 1994 which granted licenses to companies that applied to open online casinos. Today many casino and sports booking companies operate under a license granted following this legislation and Antigua and Barbuda is one of the most popular countries in online gambling industry’s to register your betting company in. · During 1994, Microgaming was founded and became the first and largest online gambling software provider and it is still used by many casino and poker rooms today. · After 1994 online casinos, poker and betting companies developed and bloomed, creating a very developed market, and now Malta, UK, Gibraltar, Curazao, Canada and the Isle of Man also offer online gambling licensing services. · However, the laws and rules regarding targeting a certain country for gambling can vary. · The fastest growing giant, GOLDEN RACE exhibited in the last Caribbean Gaming Show & Summit in Jamaica. · eSports (also known as electronic sports, esports, e-sports, competitive (video) gaming, professional (video) gaming, or pro gaming) are a form of competition that is facilitated by electronic systems, particularly video games; the input of players and teams as well as the output of the eSports system are mediated by human-computer interfaces. · eSports is on the brink of becoming a billion-dollar industry. It’s growing exponentially fast, and in Asia it was recently announced that eSports would become a medal event at the 2022 Asian Games in Hangzhou, China. · Millennial e-Sports leading company in the industry, recently spoke at CGS2017 , in Jamaica. · Virtual Sports is a mixture of e-sports, slot machine games and sport betting. · William Hill, the British Bookmaker open the US market in Las Vegas. · Inspired Gaming has follow in Atlantic City. · Virtual Sports can be offered in New Jersey through both Casinos´ on line partners and at bars and special areas at their brick and mortar facilities. · With 2 American actors on top. Fan Duel and Draft Kings. The two DFS sites have been in heavy competition within the United States. · The incorporation in the UK for Fan Duel could very much be in response to Draft Kings’ recent February launch in the UK. · At the moment, fans are only allowed to play in Premier League football. · Currently, the UK version of the app has over 4 million regular players. · In the US, The Federal Trade Commission will file a lawsuit to block the proposed merger of Fan Duel and Draft Kings, dealing a major blow to two companies that sought to combine in order to remedy their shared business and regulatory woes. Interested in updated information?. Send us an email to registration@cgssummit.com to keep you informed of our next event in the Caribbean. 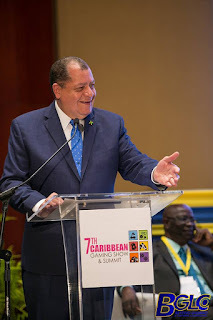 Jamaica´s Minister of Finance and Public Service, Hon.Audley Shaw opening CGS2017Summit. On June 14 and 15, Jamaica open doors to celebrate the 7th Anniversary of the Caribbean Gaming Show &Summit. Topics and Speakers from all over the world were selected to join us in this new edition. The BGLC support and endorsement was vital. As one of our Platinum Sponsors this event had the presence of important local Authorities that gave the Summit a Top Level. By far, and out of discussion the Best Summmit of the year in Latin America and the Caribbean. Caribbean Gaming Show & Summit, once again demonstrated being "The Best Place to Network". Please enjoy some views of these maginficent days in Jamaica. Follow us! to see more of the CGS2017. You must save the date if you are in the IGaming and eSports Industry. The Caribbean is expanding their business scope and Puerto Rico is the best jurisdiction to host this 2 days Conference.